Home to 2 United States Presidents, Quincy, Massachusetts is a city with a rich heritage and numerous amenities. Buy a home in Quincy and enjoy all it has to offer, in addition to its close proximity to downtown Boston. Quincy, also known as the City of Presidents, has acres of gorgeous parks, hiking and rock climbing at the Blue Hills Reservation, multiple world class golf course, and 27 miles of picturesque coastline and beaches. Quincy is home to numerous prestigious neighborhoods, all boasting impressive real estate options for prospective homebuyers. One such neighborhood is Wollaston. Wollaston is home to a vibrant commercial district, as well as multiple residential streets with homes of varying architectural styles, sizes and prices. Wollaston is bordered by North Quincy on the north, Quincy Center and Merrymount on the south and southeast, Quincy Bay on the east and Milton, Massachusetts on the west. The neighborhood of Wollaston is divided into 2 parts, Wollaston Park, located on the Wollaston Beach side of Hancock Street, and Wollaston Heights, located on the Wollaston Hill side. Students residing in Wollaston are served by Quincy Public Schools, a district comprised of 11 elementary schools, 5 middle schools and 2 high schools. In addition to excellent educational opportunities, residents of Wollaston also enjoy all the exquisite dining options available in Quincy. Quincy is largely considered the dining capital of Boston’s South Shore and boasts an impressive range of restaurants. Within Quincy you can find Asian cuisine, Indian, Italian, Mexican, cuisine and everything in between. A few of the locals’ favorite eateries include The Clam Box, The Ice Box, Coffee Break Cafe, among others. 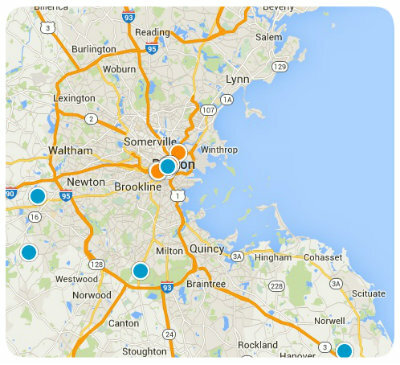 If you would like more information regarding homes for sale in Wollaston in Quincy, Massachusetts, or you have other Boston metro area real estate questions, please do not hesitate to contact us today.